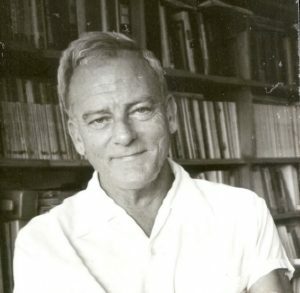 Douglas Livingstone was a prolific poet, playwright, author and scientist. His first foray into publishing his work was a slim pamphlet selection published in 1960 at the youthful age of 28, The Skull in the Mud (Outpost Publications). Over a 35 year period he had streams of poems published in various literary magazines and journals both locally but also in the United Kingdom, (frequently in London Magazine), Peru, India, New Zealand, the USA and elsewhere. 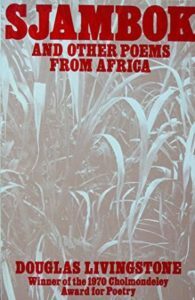 His collections include Sjambok and Other Poems from Africa (Oxford University Press, 1964), Poems (by Thomas Kinsella, Douglas Livingstone and Anne Sexton) (Oxford University Press, 1968), Eyes Closed Against the Sun (OUP, London, 1970), A Rosary of Bone (David Philip, 1975), The Anvil’s Undertone (AD Donker, 1978), Selected Poems (AD Donker, 1984) and A Littoral Zone (The Carrefour Press, 1991). On Livingstone’s death, and whilst compiling his Collected Works, Malcolm Hacksley recounts how over 300 completed but unpublished poems were discovered. The editors were, due to space constraints, only able to print approximately one-third of the unpublished poems. This column cannot do justice to the extent of his work. Our Featured Poem of the Week only runs for 8 weeks and so I will be forced to make a selection of roughly just one poem per collection. Livingstone’s volume of Collected Works, referred to in the Sources below, is essential reading for any South African poet. Douglas Livingstone had an interesting childhood. He was born in Kuala Lumpur, Malaysia. His parents were both Scottish, father a British colonial police officer and his mother a nurse. As a child, he was schooled in Roman Catholic convents in Malaya and later Australia. When Singapore fell to the Japanese army during World War II, his mother, sister and two cousins were evacuated to Sri Lanka and eventually landed in Durban in 1942 when he was 10 years of age. His father remained a prisoner of war in Sumatra. In Marco Fazzini’s fascinating interview account with Livingstone, Livingstone recalls how he grew up, “completely wild”, on the Natal south coast. He attended various government schools in Margate and Port Shepstone, where his behaviour was regarded as disruptive. In 1946, his father returned from the war and sent the recalcitrant teenager off to boarding school at Kearnsey College in Natal, while the rest of his family returned to Malaya. According to Livingstone, he spent his holidays with an old lady on the Natal south coast or just “roughing it hobo-fashion on Durban beaches and street”. However, it was in the Kearnsey library that he discovered Shelley, Byron and Keats. He discusses with Fazzini how he was completely self-taught in the art of poetry, discovering a love for classical Greek and Roman antiquity and reading “everything I could get hold of “ from Plato to Horace, from Virgil to Catullus. After finishing his schooling, he filled his days lifesaving, surfing and doing night shift duty as bench-chemist at Crookes Brothers Sugar Mill in Natal. He had a leaning toward medicine and healing humans but could never afford the fees to put him through medical school at university. Instead, he worked in Zimbabwe in a metallurgical laboratory and later in 1952, obtained a position as a learner medical laboratory technician at the Pasteur Institute, where, after four years, he obtained a qualification as a bacteriologist. In 1959, he moved to Zambia to run the Pathological Diagnostic Laboratory at the Kabwe General Hospital. His first collection was published in 1960 while in Zambia. Four years later, he cashed in his pension, to head off (in his Lancia Flavia coupé), to Durban to research the microbiological measurements of sea pollution off the coast of Durban, a job he pursued for the rest of his life, publishing over 100 scientific articles and reports in both local and international journals and specialist publications. In 1982, he was awarded a DLitt, honoris causa by the University of Natal and in 1989 he obtained a PhD in Biological Science from the University of Natal. In 1990, Rhodes University awarded him a DLitt, honoris causa. Livingstone was a true mix of scientist and poet. He was married and divorced twice and never had children. Livingstone was a poet deeply rooted in nature and the never-ending search to ascertain if humanity, in all its consciousness, could draw itself back into reciprocity with nature. Don Maclennan declares that the driving force behind Livingstone’s poetry is the disconnection of humanity with nature and the search for a meaningful connection. His works delight in the meticulous, physical imagery of Africa, horn, hoof, dung and animal behavior, harking back to Roy Campbell, but grounded in thoroughly modern depictions. His profession as a bacterial microbiologist – and the science associated therewith – influenced his poetry. He describes to Fazzani a fascination with language harbouring back to his boyhood. To Livingstone “language civilizes”. One writes poetry, he says, not because you feel like it but because you have to. Perhaps one of the most compelling aspects of Livingstone’s work, is his ability to view Africa as fresh and full of possibility. His poetry is devoid of academic influence, embracing common sense and an infallible ability to identify with the common man. It is characterized by simplicity in language and a muted rhyme and rhythm. His exploration of humanity as an essentially cruel species juxtaposed with his belief that life and the physical world are a blessing, lend his poetry tension, weight and depth. His animal poems recognize cruelty and cunning and often describe interactions between human and animal behavior. But it is his ability to defamiliarise that Michael Chapman believes is one of the greatest elements of his poetry. It points to his ability to invest his personal experiences with a wider resonance, a peculiarly modernist tactic, extending his personal vision. Maclennan describes as Livingstone’s “crowning achievement”, The Littoral Zone, where he forays into a different persona, Giovanni Jacopo. The collection contains a series of carefully crafted meditations written by this pseudonym. The bawdy pronouncements of this alter ego, go to the core of Livingstone’s views on love, life and art and express an energy and freedom not previously seen in Livingstone’s writing. Douglas Livingstone died prematurely in Durban of cancer, aged 64 and his loss was an incalculable loss to his family, his many friends and to South African poetry. Chapman, M. 1984. South African English Poetry: A Modern Perspective. Cape Town: AD Donker Publishers (Pty) Ltd.
Fazzini, M (Ed). 2009. Douglas Livingstone: Loving: Selected Poems and Other Writings. Italy: Amos Edizioni. Hacksley, M and Maclennan, D (Eds). 2004. 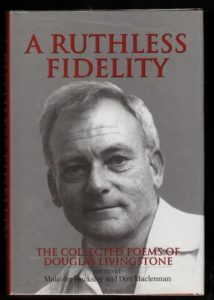 A Ruthless Fidelity: The Collected Poems of Douglas Livingstone. Johannesburg & Cape Town: AD Donker Publishers (Pty) Ltd.